The most recent book by Professor Graham Matthews – YIF Technical Director – is entitled ‘Integrated Vector Management’ and is due to be published by Wiley-Blackwell mid-2011. 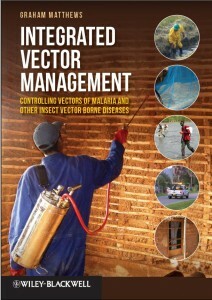 It covers the use of different control techniques for insect vectors of human disease with chapters on the diseases transmitted by insect vectors, the types of insecticide, and application technologies. In particular, the use of indoor residual spraying (IRS), space treatments, larviciding and bednets. The primary focus is the integration of these technologies with non-chemical methods such as drainage of breeding sites and house improvements to prevent the entry of vectors.